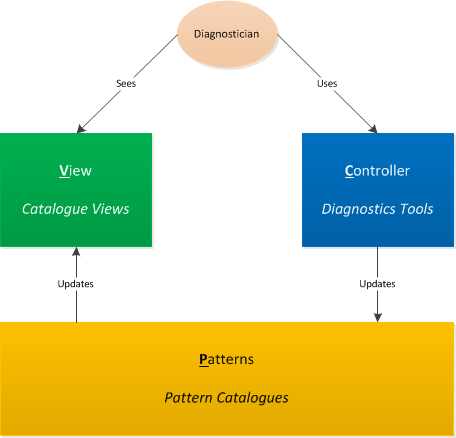 Patterns - represent pattern catalogues from pattern-driven and pattern-based software diagnostics methodology. It corresponds to Model in traditional Model - View - Controller software architecture pattern. View - represents pattern catalogue(s) view which might include concrete pattern implementations such as OS and product specifics. A view can also be based on an intersection of several pattern catalogues, for example, memory analysis, malware analysis, and trace analysis. A user diagnostician sees such views. Any updates to underlying pattern catalogues are reflected in pattern views. Controller - represents software diagnostics tools architecture and designed using software construction patterns. Such tools may include automated diagnostics or human-assisted debuggers and problem analysis tools. A user diagnostician uses such controllers. Such use may result in updates to underlying pattern catalogues when a new pattern is discovered, for example.